In case you haven’t heard, the wine industry is having a bad year thanks to the weather. European production numbers are going to be significantly down, which suggests that the worldwide export market might be headed for a shakeup. What might that look like? We create a new viz to demonstrate the current state of the market. We got our numbers for 2016 wine exports from the World’s Top Exports, a website that tracks the value of goods moving between countries. Our viz adjusts the size of each continent according to the relative proportion of its wine export market. That’s why North America appears so much smaller than Europe—it produces a mere 5% of the world’s wine exports compared to Europe’s 70%. To make this visualization a bit easier, we also added bubbles corresponding to the size of the market for each country. As you can quickly see, a few key players dominate the international wine market. France is by far and away the market leader, putting out 28.2% of the world’s exports. Italy comes in second at 19.2% followed by Spain at 9.2%. 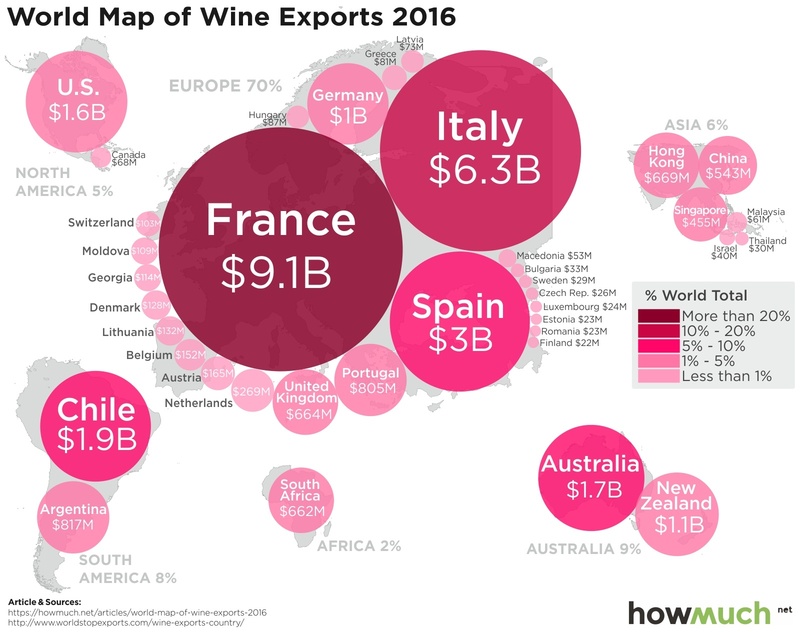 The fact that these countries have distinct cuisines and cultures centered around winemaking goes a long way to explain their nea -monopoly. Chile and Australia round out the top five wine exporters, sending away 5.7% and 5.3% of the world’s exports, respectively. No other country crosses the 5% threshold. This creates a significant imbalance in the market weighted heavily toward the Europeans. Other countries have a long way to go before they even come close. But don’t underestimate how much the wine industry might change next year. Business Insider is reporting the worst year for production since 1961. Catastrophic fires recently tore through Napa, devastating several winemakers in California. On the positive side, companies like Bright Cellars are now leveraging big data to create unique taste profiles for their customers, letting you mail order small-batch wines directly to your house. It’s safe to say the market is under significant pressure to change. With that being said, here’s a list of the top ten wine exporters in the world right now, broken down by the total value of their exports ($ millions) and the percentage of the world’s overall total. It’s impossible to say what this list will look like ten years from now, but suffice it to say that European countries can expect other parts of the world to start catching up. Weather patterns can always change, and tech companies might introduce new people to good wine, expanding the market for everyone. In the meantime, let’s raise a glass to the French: à votre santé!